Mammoth Coolers: A Good Investment, or a Mammoth Fail? Mammoth Coolers tried to get in on the explosion of the high-end cooler market that started about 6 years ago, when word spread like wildfire about Yeti’s super durable, super high-performance coolers that you could put a beer and a live grenade in, and have the former emerge as the victor (still cold, of course). OK, that last bit is an absurd exaggeration, but the part about Yeti sparking a cooler revolution is of course quite true. Since about 2011 when they really hit it big and their products started flying off the shelves, Yeti has had to fight and fend off an absurd amount of competition from manufacturers that have produced similarly high-quality roto-molded coolers, albeit with more manageable price tags. Mammoth was (is) one of those competitors, although they have not fared quite as well since their entrance to the market as the likes of Grizzly, RTIC, Orca, K2 coolers, etc. Before their high-end range of coolers could even gain a fair showing in the industry, word got out that the company was being sued by Yeti themselves under a trade dress infringement lawsuit, for manufacturing and selling products that were ‘confusingly similar’ to their own. 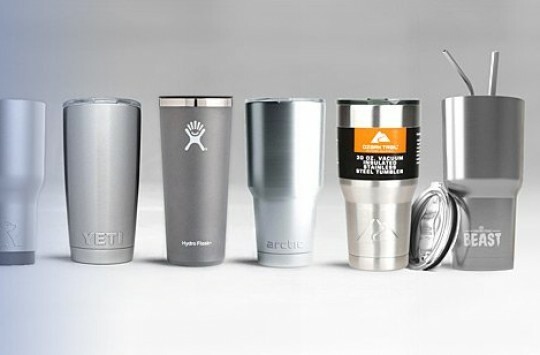 (Yeti filed the same lawsuit recently against Wal-Mart for infringement on their Rambler tumblers). Since then (this was only back in December of 2015), Mammoth has become a veritable phantom as far as the availability of their coolers are concerned. And, a verdict on the lawsuit has apparently remained rather hush-hush, as we could not manage to scrape up much news on the case after scouring the net. So what does this all mean for you, the consumer? Mammoth Coolers: Quality products, no matter how you look at it. You can argue all you want about the ethics and moral implications of buying a Mammoth cooler or Mammoth ice chest (or any of Yeti’s other competitors, for that matter), but the bottom line is that is a job for the courts and fancy lawyers to sort out. Our job? To provide a simple, unbiased, honest-as-can-be product review. So let’s get to it! Mammoth originally manufactured and distributed two different models of coolers: the Discovery and Titan series. All of the coolers are in fact very well-made, and constructed of state-of-the-art materials that you’d expect to see in a high-end cooler. Like Yeti’s, they are roto-molded, meaning the liquid insulation material is poured into the walls of the cooler, and then rotated around continuously while the insulation expands and solidifies in a permanent fashion in all nooks and crannies of the cooler. As far as durability, Mammoth Coolers actually have some of the thickest sidewalls in the industry, at 2” (this includes the lid, too). This provides for some serious rigidity, durability and ice-retention performance, but also makes them just a bit heavier than some of their competitors’ models. 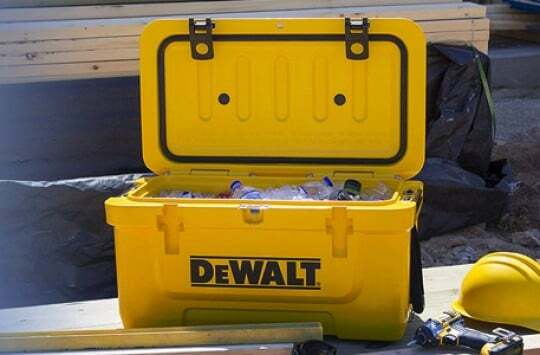 Features-wise, all Mammoth ice chests include a heavy-duty non-skid bottom, ‘easy-grip’ carrying handles attached to heavy-duty rope, and a convenient no-leak drain system with a sealed gasket. Also, the lid closes onto a high-quality, sealed gasket as well. 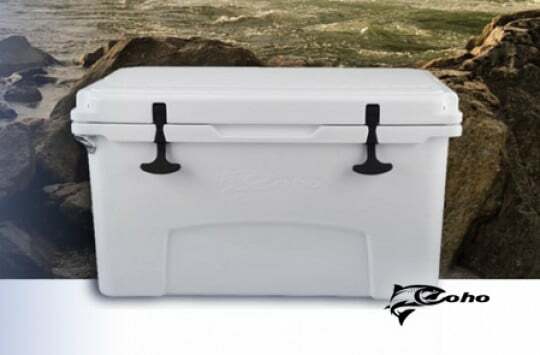 One of Mammoth Cooler’s best features, though, in our opinion, is their hinge system which is a one-piece design that extends through the full length of the lid. This allows for the entire hinge system to be virtually indestructible – it’ll last as long as the cooler lasts, which will probably be a very, very, very long time. The Discovery series Mammoth ice hests were initially available in eight different sizes: 23.4, 46.5, 48.4, 65.1, 72.9, 98.3, 104.7, and 164.8-quarts. (Strange sizes, huh?) 164-quarts is a darn big ice chest. We’re guessing they had something in mind at least when they came up with the name ‘Mammoth’. Check availability and latest price on Amazon. The Titan models were produced in 31, 67, 83, 100, and 130-quart options. In all honesty, the product descriptions for both the Titan and Discovery models are exactly the same on the Mammoth website, so we’re not really sure what the heck the difference between the two is, other than size options, color, and finish. (The Discovery coolers are tan and have a ‘rough’ finish, while the Titan ones are white and have a ‘smooth’ finish). Wondering where to buy Mammoth Coolers? Like we mentioned earlier, Mammoth have become a bit ghost-like as far as the availability of their different models.Currently, it appears that only the Discovery models are available on Amazon, and in very limited quantities. There was a ‘blemished’ batch (factory second, we’re guessing?) of the Titan 31-quart models available on Amazon, but they have since sold out. We can’t say for certain, but we’re wondering if the Yeti lawsuit has something to do with the current scarce availability of Mammoth Coolers. Seems plausible. The bottom line is, the whole aura behind this company seems a bit funky. From their odd size-ranges to their haphazardly constructed website with identical descriptions for two apparently ‘different’ products, the whole thing is just a little strange. Which is a bit of a shame, in fact, because like we mentioned in the review, these are actually some darn good coolers. If you get a chance to get your hands on one for a decent price, then by all means go for it – Mammoth Coolers can stand up to any of the other industry-leading brands. However, we wouldn’t recommend spending full retail price on one, and we certainly don’t recommend scrambling around like a chicken with its head cut off trying to find one – if you do, you’ll probably just end up giving yourself a Mammoth headache.